Today is National Irish Coffee Day, and it's a beautiful day in the neighborhood! If I have time later, I'm going to stop by the Buena Vista Cafe for a glass of Irish Coffee. 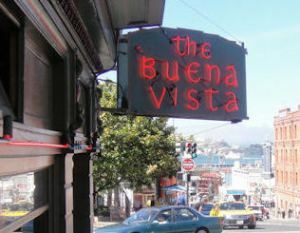 Irish Coffee was invented at the Buena Vista Cafe, right here in San Francisco. Many years ago, on my first day in California, I was lucky to hitch a ride with a visiting dignitary. Don't ask. Things happen! The day's tour of San Francisco included the hills of San Francisco, Sonoma County, the Renaissance Fair, Sausalito, Fisherman's Wharf, the Palace of Fine Arts, Cliff House, the Golden Gate Bridge and a stop at the Buena Vista Cafe for an Irish Coffee. I saw more of the San Francisco Bay Area on that one day than I did over the next ten years. Irish Coffee is a very San Francisco drink invented in 1952 at The Buena Vista Cafe. The recipe was a collaborative effort between Jack Koeppler, the Buena Vista’s owner, and Stanton Delaplane, a well-known international travel writer and San Francisco Chronicle columnist. Here's the original recipe. 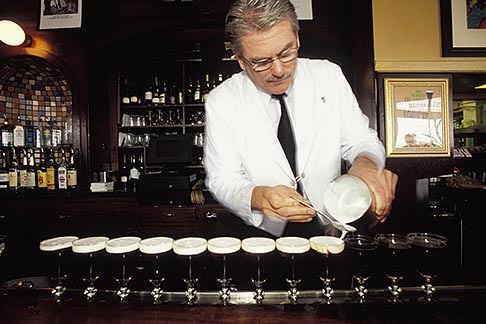 Irish Coffee at the Buena Vista is still made the same way. The official story of Irish Coffee tells of the perseverance and repeated attempts of Koeppler & Delaplane and even a trip to Shannon Airport, where a forerunner of Koeppler’s vision was served. 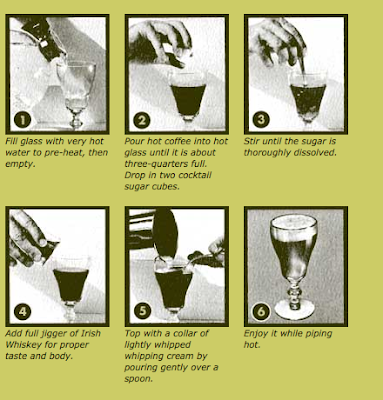 The whipped cream posed a problem, but the input of a prominent dairy farmer turned Mayor of San Francisco, solved the problem: Age the cream for 48 hours and froth it to a precise consistency so it would float on top of the hot coffee, to Koeppler’s specifications. So if you're in San Francisco today, it's a big day at the Buena Vista. Stop by and raise a glass! Since I love alcohol infused truffles, I'm posting a recipe for Irish Coffee Truffles. You'll love this easy recipe from Martha Stewart Weddings. I use darker chocolate than in the original recipe, but otherwise, it's just about the same. I also often roll the truffles in ground chocolate espresso beans! This recipe is pretty much no fail, and that's what I like! Coat 9-by-5-inch loaf pan with cooking spray; line with plastic wrap, allowing a 2-inch overhang; set aside. Put chocolate and butter into medium heatproof bowl set over pan of simmering water; stir until chocolate and butter have melted. Remove from heat. In separate saucepan, bring cream, corn syrup, and brown sugar to boil over medium-high heat, stirring until sugar has dissolved. Immediately pour over chocolate mixture; whisk until smooth. Whisk in yolks, whiskey, coffee extract, and salt. Cover with plastic wrap, pressing directly on surface to prevent a skin from forming. Refrigerate until firm enough to roll into balls, about 4 hours (or more). Using a1-inch ice cream scoop or medium melon baller, scoop chocolate into balls, immersing scoop completely, then rotating it; transfer to rimmed baking sheet lined with parchment. Refrigerate until firm, about 15 minutes. Put cocoa powder into shallow dish. Remove truffles from refrigerator. Roll each ball in your palms until completely smooth, then roll in cocoa powder (or crushed chocolate covered espresso beans) to coat (if truffles become too soft to roll, return to refrigerator until firm); transfer to rimmed baking sheet lined with parchment paper. Cover with plastic wrap, and refrigerate at least 30 minutes (up to 3 days). No time or ingredients to make your own? You can buy Irish Coffee Truffles. 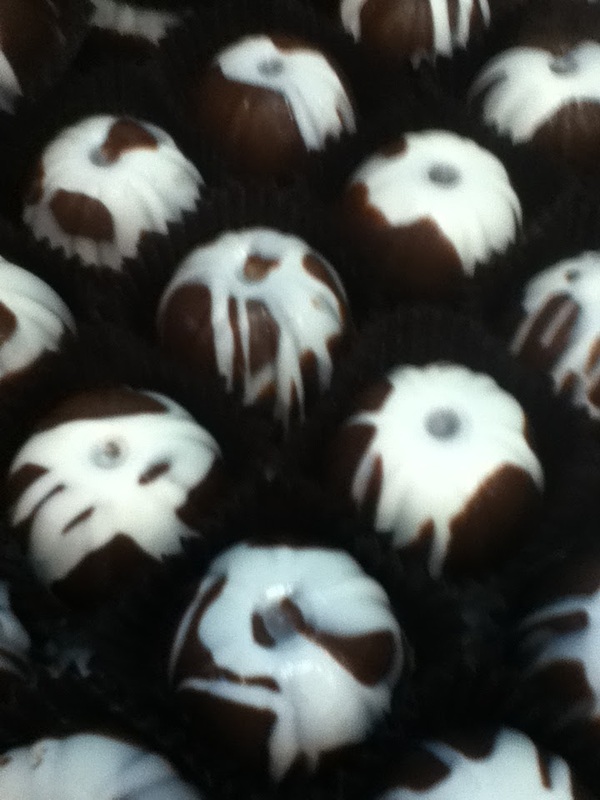 I'm very fond of the Coeur d'Alene Irish Coffee Truffle. Maybe easier to find if you have to celebrate today would be the Lindt Irish Coffee Bar. They're both great and use real Irish whisky. Or, you can check with your local chocolatier. They might make a great Irish Coffee Truffle. If you find one you like, let me know! Make a comment below and win chocolate!